The Dominator Series is made tough and roomy for those dirty jobs. It is easily identified by its kelly green color and has additional features that help protect you against splash, grit, and grime. 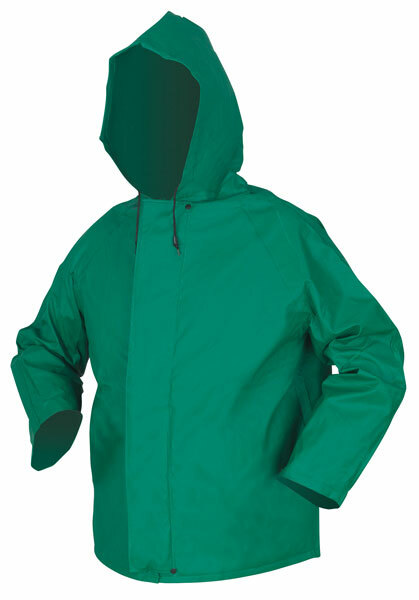 The 388JH is a jacket with attached drawstring hood. It also features a zipper front with oversized storm flap and take up snaps at the wrists. This jacket has a plain back, no pockets, and no vents to protect from splash. Dominate your environment with the Dominator. This material is treated to be limited flammability. NOT intended for use as protection against ARC Flash or Flash Fire.